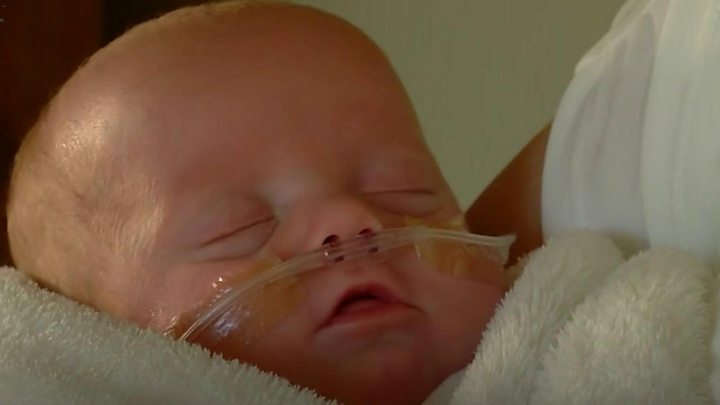 On a hospital ward in Leeds, parents of premature babies are encouraged to help care for their newborns - from taking temperatures to the delicate task of inserting feeding tubes. So how does the approach benefit families? "It is just nice to feel like a mum, rather than just somebody watching," Anna Cox tells the Victoria Derbyshire programme, as she takes the temperature of her baby. Lola was born at just 23 weeks. She had a twin brother who sadly did not survive and she was given little hope of survival. "During labour, one of the neo-natal consultants came to see us and painted a really bad picture that she could have all sorts of problems," Anna says. Lola was cared for at St James's University Hospital in Leeds -the first in the UK to implement a family integrated care system. It put parents - not nurses - in charge of everything other than the most complicated medical treatments for their premature babies while they were in hospital. "One of the jobs we have to do is take her temperature, maybe every three or four hours," Anna says. "It is a pretty simple procedure really." However, parents also perform more complicated tasks, including inserting a tube into their baby's nose to allow them to feed. "There are certain things they [nurses] obviously watch over you quite a bit to begin with because it needs to be done right," she says. "They do like to make sure you know what you're doing, they wouldn't just leave you to it." Katie Crossley's daughter, Molly, was born eight weeks early and had breathing difficulties. "While I'm here, I pretty much do everything that a normal mum would do," she says. "Everything, from feeding to medicine, cleaning, bathing." She has also been taught how to insert a tube up Molly's nose and into her stomach allowing her to be fed. "Being around it and watching it has made me more confident when I've come to actually doing it," she says. In the past, caring for premature babies usually meant keeping parents at arm's length. As recently as 20 years ago, the closest parents of premature babies could get to their newborns was looking at them through a glass window. It meant the bond between parent and child was harder to establish and breastfeeding rates were often lower. But the idea of putting parents in charge of neonatal care is not a new one. In the 1970s in Tallinn, Estonia - then part of the Soviet Union - the head of the local hospital faced a problem. The hospital had too many premature babies to look after and not enough nurses. However, they soon noticed the system was helping babies. Under his system, mothers had more regular "skin to skin" contact with premature babies. It resulted in better breastfeeding rates and shorter hospital stays. It took 30 years for other hospitals to copy the system, but now the system has been introduced in Canada, Australia, New Zealand, and now Leeds. Dr Liz McKechnie, consultant neonatologist at St James's, says the family integrated care scheme aims to put the parent at "the very centre of the team caring for the baby". "It is not rocket science, it is such a straightforward thing to do, to allow parents to look after their babies," she says. She is adamant the move was not down to cost-cutting and that nursing levels on the unit have not dropped. "In the past, care has been very much the nurse leading it, so they're saying 'right, it's feed time, it's bath time'. Whereas now, it is very much the parents who are leading that. "They are feeding the baby when the baby needs feeding, rather than when the clock says it is feed time - and that's much better for the baby." She says the new system was a "major cultural change" and caused anxiety among nurses on the neonatal unit when it was introduced 18 months ago. Nurses on the ward say training parents to care for their babies takes as long - if not longer - than doing the procedures themselves. But they say families are getting home sooner, the long-term development of babies is improving and breastfeeding rates have increased. The system is about to be trialled in the intensive care unit in St James's sister hospital. As for Lola, she was allowed home just before she was 14 weeks old. "Without the family integrated care we would've been in a lot longer," says her mother, Anna. "Lola is still on oxygen and [otherwise] they wouldn't have allowed us to come home with that. "I feel really confident in everything they taught us." Dr McKechnie adds: "The fact is that families are going home more confident and more able to care for their babies, and that means a lot. "Nobody wants to stop it, it is definitely here to stay, everybody can see the benefits of it."